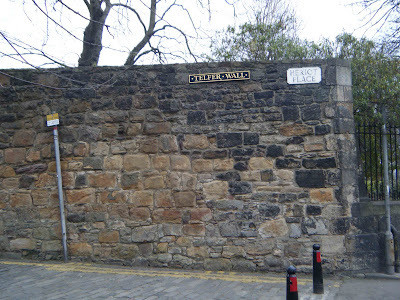 The sections of the Telfer Wall shown below, can all be found to the South of Edinburgh Castle, just off Lauriston Place and West Port\Grass Market. 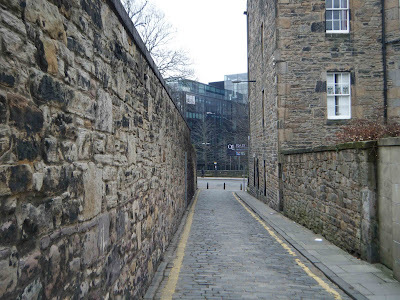 The wall stretches for about three hundred and fifty feet between Lauriston Place and the end of Heriot Place. Here it stops at the top of a flight of steps that leads down to Grass Market. At the top of the steps, stands a tower, marking the starting point of the Flodden Wall. Above. The most Southerly portion of the Telfer Wall at Heriot Place. The Telfer wall was built between 1628 and 1636 and was named after the mason responsible for its building, John Taillefer. The wall was built at the behest of Edinburgh Town Council, who, in 1618, had purchased ten acres of land laying to the West of Greyfriars Kirk. Above. Looking South down Heriot Place with the Telfer wall on the left of the photo. The land was eventually sold to the George Heriot's trust, who subsequently built the spectacular George Heriot School there. With other portions of the town's walls demolished to make way for new housing and roads, it's a relief that this tiny portion of Edinburgh's historical walls survives. The Heriot Trust have made sure that this portion of the Telfer wall is maintained to its full height in some areas, forty feet in places. Above. Looking North up Heriot Place, with the castle in the background. Above. Looking South towards Lauriston Place. 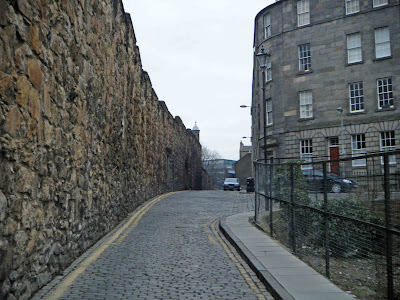 The Telfer wall was 'tagged' onto the Southern route of the older and more defensible Flodden Wall, so its course only ran to the West, the South and a tiny portion to the East, of Heriot Place. 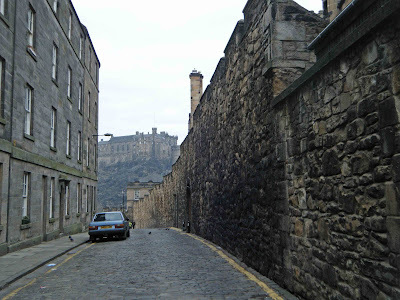 This is a great walk North towards the castle, leading to Brown's Place, Vennel, Grass Market then up the hill using Granny's Green Steps and then onto Johnstone Terrace which runs along the Southern most part of the hill upon which Edinburgh Castle is built.